Guide price 365,000-385,000. 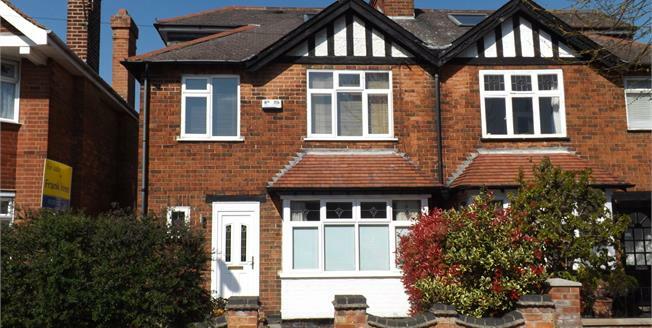 An extended four bedroom semi detached house in central West Bridgford. In brief the well presented accommodation comprises entrance hall, groundfloor WC, lounge, open plan dining kitchen, family room. To the first floor there are three bedrooms and a stunning 4 piece family bathroom. To the second floor there is the master bedroom with en suite and built in wardrobes. Attractive rear garden. Gas heating. Permit parking. Window to the front elevation, heated towel rail, tiled flooring. Low level WC, vanity unit and wash hand basin. Window to the front elevation, radiator and coal effect gas fire. Radiator, built in cupboards, open plan to the kitchen. Window to the rear elevation, door to the side access, tiled flooring. Roll edge work surface, wall and base level units, breakfast bar, stainless steel sink unit and drainer, overhead extractor, Smeg free standing stove, plumbing for dishwasher and washing machine. Window to the rear elevation, motorised Velux with rain sensors, patio door to the garden, radiator. Window to the rear elevation, heated towel rail, tiled flooring with under floor heating. Low level WC, panelled bath, shower cubicle, vanity unit and wash hand basin, wall mounted cabinet. Window to the rear elevation, radiator, sliding door wardrobe and walk in wardrobe. Velux window. Heated towel rail, under floor heating. Low level WC, single enclosure shower, pedestal sink. The attractive mature rear garden is mainly laid to lawn with an extensive patio area. There is a garden shed, power point, tap and exterior lighting.